Mike Greener/Chronicle; The neon Hotel Baxter sign will be relit this winter. The historic sign was erected in 1929 when Bozeman's tallest building was built. Our Reception Venue – The Baxter! Mike Greener/Chronicle; The neon Hotel Baxter sign will be relit this winter. The historic sign was erected in 1929 when Bozeman’s tallest building was built. Our venue for the reception is the historic Baxter Hotel. We are so excited! Extra excited because last week the large sign on the top of the building was relit for the first time in decades. Here is the low down: The Baxter Hotel was built in 1929 and is no longer a hotel as the rooms have been converted into apartments. The ground floor holds two bars (the Bacchus Pub and Ted’s Bar) and a restaurant, Ted’s, which one of my favorite places to eat in Bozeman. We’ll be celebrating in the Ballroom on the second floor. 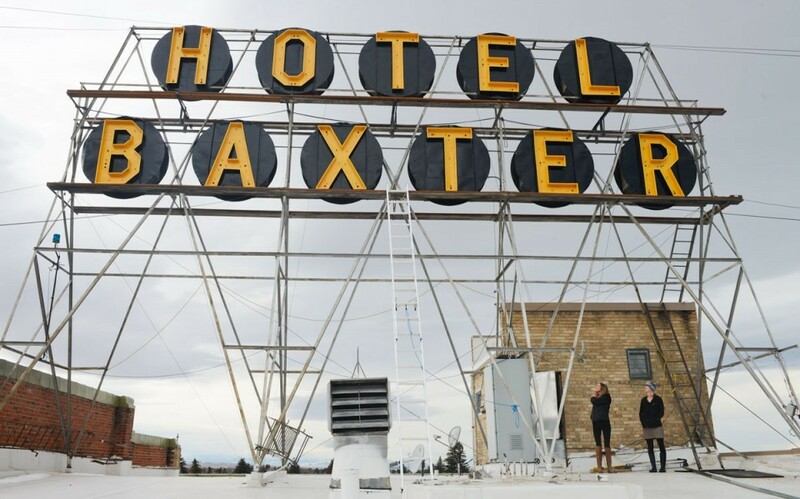 Unique features of the Baxter building include a 32-foot high by 45-foot wide electric “Hotel Baxter” sign on the roof. Erected when the building was completed in 1929, it was intended to be seen from the top of mountain passes up to 70 miles away to “serve as a beacon for travelers.”The red neon sign was nonfunctional for decades, but was refurbished, repaired, and officially re-lit on January 10, 2013. The roof of the building also features a flashing blue light, which is turned on throughout the winter to alert local skiers that fresh powder snow is falling at the Bridger Bowl Ski Area. First installed in 1988, it is activated every time Bridger Bowl accumulates two inches of fresh snow, and remains on for 24 hours. Local skiers depend upon the beacon because the ski area can have a great deal of fresh powder, dubbed “cold smoke” by the locals, even when it is not snowing in Bozeman. For this reason, maintenance of the light is a priority for skiers. It has only been out of operation for two days in the last 20 years. I can’t wait to see everyone at the Baxter! Bring your party pants/dress and dancing shoes. There WILL be dancing. Yipee! We have a date! Saturday, June 8th, 2013! And we want you to save it. 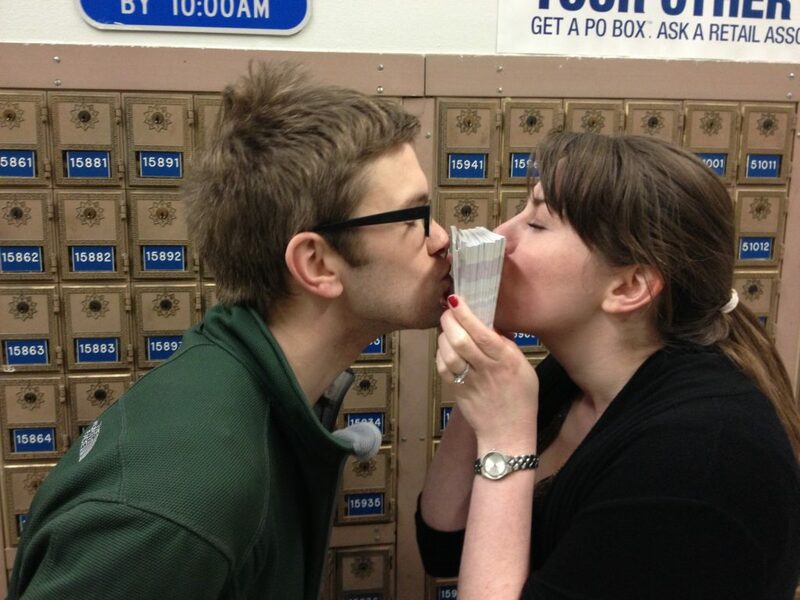 Yesterday we sent our first batch of Save The Dates (photo by the talented Bryce Covey, designed by the lovely Shannon Erickson). There isn’t a sneak peek pic as I want them to be a surprise so check your mail. 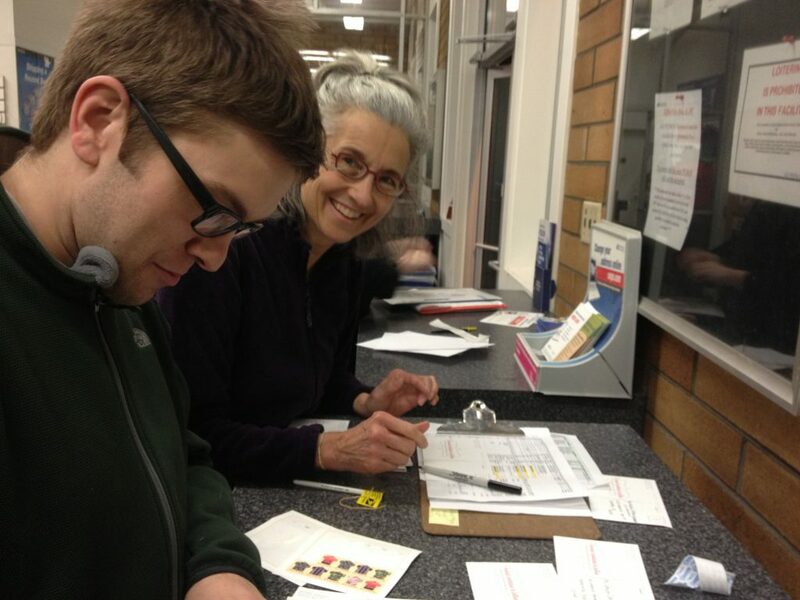 Thanks to Momma F for helping address and send! 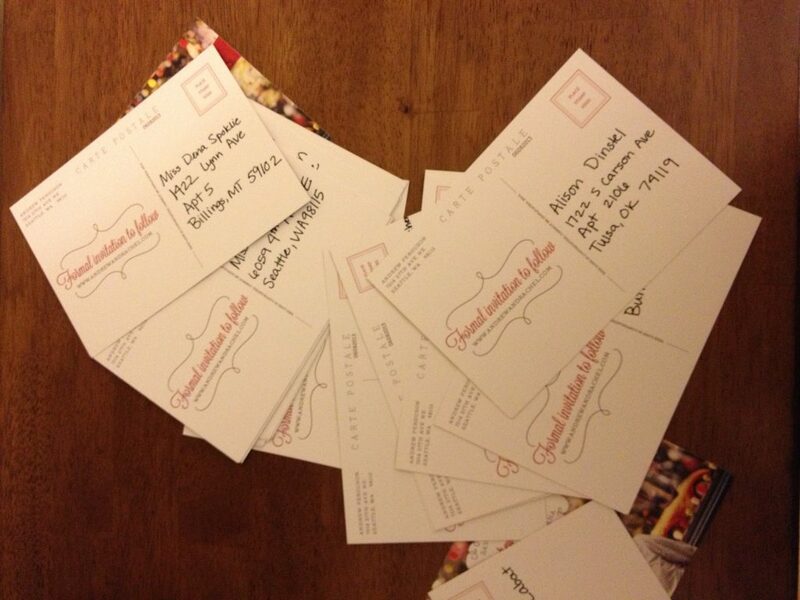 Sending – That’s a lot of postcards!